Thousand of miles from the nearest continent the volcanic mountains of Hawai'i stood somber and alone in the Pacific, void of nearly all life. Lifeless they would remain if not for the birds, the currents, and the wind. Seeds were carried by the tides that washed across the shores. Storms brought more seeds with their howling winds and rains. The birds, like the small golden plover, brought the rest. Birds would fly from as far as 3,000 miles away, non-stop. Eventually the Hawaiian islands would be covered with extensive forest habitats, shrubbery, and grasslands. Soil and precipitation differences around the islands would cater to all kinds of plant-life. In time, the foreign species would become unique to all the world, found only in Hawai'i. Today, we call them endemic Hawaiian species like the Nene (Hawaiian goose) and silversword (which is actually a relative of the sunflower). You will find them no where else on the planet. These species had thousands, if not millions, of years to develop into unique flora and fauna. For thousands and thousands of years they were undisturbed by the ways of humans. Today, many of these species are not so lucky. The 'Akiapola'au (a rare bird found on the Big Island of Hawai'i) is just one example of a species that is fading fast. Most experts predict that their numbers have dwindled to between 1,000-1,500. We were very fortunate to see one as recently as 2006, so perhaps hope still remains for this incredible bird. 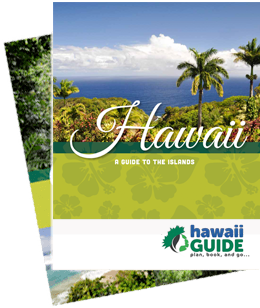 It is easy to forget that Hawai'i is much more than just the major islands in the eastern portion of the chain. The Hawaiian archipelago stretches for some 1,600 miles to the north and west, and here you'll find 84 million acres that are home to 7,000 species of birds (especially sea birds), fish and marine mammals, at least a quarter of which are unique to Hawai'i. In 2006, the President officially designated the Northwestern Hawaiian Islands a Marine National Monument creating the largest marine protected area in the world. Food plants grown commercially (or in backyards for home consumption) in Hawai'i include sugarcane, pineapples, papayas, bananas, mangoes, guavas, lichee, coconuts, avocados, breadfruit, macadamia nuts, limes, passion fruit, taro (for poi), and tamarinds. Wild animal life in Hawai'i includes mongooses (yes that's plural), rats, frogs, toads, and, in the more remote regions of some of the islands, deer, sheep, pigs (boar), donkeys, and goats. On the Big Island, even wild horses roam freely in Waipi'o Valley. The insect population is multitudinous, and marine life abounds in Hawaiian waters. Hawai'i also struggles with the many invasive species which have been brought to the islands over the years. This primarily involves plant life, but is most noticeable in the animal populations. The coqui on the Big Island, brought accidentally from Puerto Rico, are literally driving many residents out of their minds. The over population of jungle fowl (also known as Chickens) on Kaua'i is definitely noticeable, as is Kauai's lack of mongoose. Mongoose eat eggs of ground nesters, controlling moa (fowl) population. Kauaii never got their mongoose. Legend has it that a mongoose bit a dock worker, got thrown off the dock, and never made it to the island. Mongoose exist on all of the other major Hawaiian islands, as do the rats (also non-native) that they mongoose were imported to kill. One can see how things quickly get out of hand when animals are introduced to a new environment like Hawai'i.